There are many options for the handling and storage of liquid manure. This page describes and differentiates some of the most common systems. Most agricultural treatment lagoons are anaerobic lagoons. Anaerobic lagoons are earthen structures, which look at first glance like farm ponds. These lagoons are designed to provide biological treatment and long term storage of animal waste. Anaerobic lagoons are larger than manure storage basins, which do not provide significant biological treatment or long storage periods, but smaller than aerobic lagoons. Even though aerobic lagoons are designed to provide a higher degree of treatment with fewer odors, anaerobic lagoons decompose more organic matter per unit volume. Because of their treatment and storage capabilities anaerobic lagoons are a good compromise between storage basins and aerobic lagoons. Anaerobic treatment of waste occurs without free oxygen to liquefy or degrade high BOD (biochemical oxygen demand) organic waste. With proper design and management the anaerobic lagoon can function for years. Odor from a well-designed and well-managed lagoon will be only slightly musty; foul odor indicates a malfunction requiring corrective action. 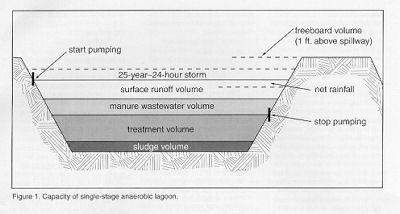 Advantages of anaerobic lagoon systems are: manure can be handled with water flushing systems, sewer lines, pumps, and irrigation equipment; the high degree of stabilization reduces odors during land application; high nitrogen reduction minimizes the land area required for liquid effluent disposal, and long-term storage is provided at low cost. Disadvantages of anaerobic lagoons include: public perception that a lagoon is an open container of manure; offensive odors if improperly designed and maintained, and limited nitrogen availability if manure is used as a fertilizer. Lagoon design is based on the manure volume produced by the animals, plus any wash down water or wasted feed. An impoundment outside in the weather must also have space for runoff which may enter the impoundment, and rainfall less evaporation, that will occur over the storage area. Additional space for a 25-year 24-hour rainfall event and required freeboard is also necessary. Lagoons must have volume for all of the above plus the minimum pool or treatment volume to allow biological degradation, and in some cases, volume for sludge accumulation. Although emergency spillways as shown in the accompanying figures have the purpose of protecting embankments from overtopping and washing away during emergency weather situations (hurricanes, etc. 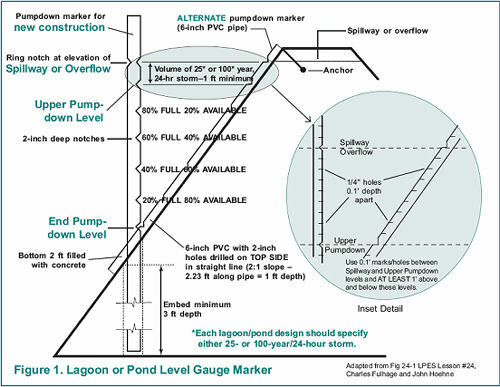 ), some states (i.e., Arkansas, at this writing) do not include these structures in lagoon and storage pond design requirements to save on construction costs. Lagoons have been used extensively to treat swine manure and store wastewater prior to land application using normal irrigation equipment, Lagoon Design and Management for Livestock Waste Treatment and Storage. Texas Agricultural Extension Service Publication E9, Proper Lagoon Management to Reduce Odor and Excessive Sludge Accumulation, by Saqib Mukhtar, Department of Agricultural Engineering, Texas A&M University. National Center for Manure and Animal Waste Management white paper summary, “Manure Management Strategies” published by North Carolina State University. A two page Executive Summary is available. The full white paper can be ordered from MWPS, Iowa State University. National Center for Manure and Animal Waste Management white paper summary, Treatment Lagoons for Agriculture published by North Carolina State University. A two page Executive Summary is available. The full white paper can be ordered from MWPS, Iowa State University. 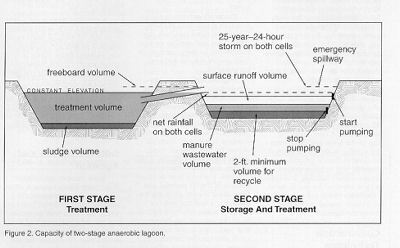 National Center for Manure and Animal Waste Management white paper summary, Closure of Earthen Manure Structures (Including Basins, Holding Ponds and Lagoons) published by North Carolina State University. A two page Executive Summary is available. The full white paper can be ordered from MWPS, Iowa State University. Page Managers: Ted Tyson, Auburn University, tysontw@auburn.edu and Saqib Mukhtar, Texas A&M University, mukhtar@tamu.edu .